Ciao friends and happy new year!! I hope you’re all starting 2018 off right, with great family, friends, food and perhaps even a dose of travel?? I am nearing the end of my Italy saga, which is exciting because I have a few fun posts to share from the fall and winter. I would really love to get caught up on blogging in the coming weeks – I had such a blast in Austria over New Year’s, and I would love to get back into sharing content with you while it’s fresh in my memory and heart :) That said, I also have a hugely busy January kicking off, with travel to NYC and the Dominican Republic, followed by my annual company conference and party here in Amsterdam, so by the end of January I know I’ll be beat and so ready for some hibernation! I am looking forward to hanging at home on dark nights, drinking red wine and doing puzzles – maybe even binging on some Netflix. I also can’t wait to make a big winter fruit salad with fresh produce from the Albert Cuyp Market, and maybe even some hearty slow cooker meals, but those dreams will have to wait a few weeks until I have some down time in Amsterdam. I am starting to compile a few New Years resolutions, and I will definitely share them here with you once I’ve given it some thought, but overall I would love this year to be about me. Ha – that sounds very self centered, and truly I don’t mean it that way ;) I make a living producing travel content, and I spend a lot of my personal time on social media and blogging. And while I LOVE being a creator vs a consumer, I also want to take violin lessons, and make it to yoga more often, and just do things that wont really have an impact on my professional or social media life, but will make me a better, happier me. I downloaded Moment on my phone, and it was really an eye opener to see how often I was spending staring at my iPhone screen. Granted, 75% of that time is typically for work related purposes, but I hate that I browse social media while I’m standing in line for my coffee, or as a ‘too lazy to get out of bed’ activity in the morning. There are a lot of things I love about social media (and to be honest, I could never quit completely because of my job) but I am often torn between sharing moments I love and that mean something to me vs wanting my feed to look professional and uniform and creatively cohesive. Right now my blog and social media ‘career’ has really taken a back seat to my job (which is really a fusion of travel and advertising, so I am totally okay with this!) so I am happy to keep my content ‘for me’ for now – but there is this niggling voice that’s poking me to get back into marketing myself and my blog, making posts that are less personal but are of more value for readers, but then there’s also a part of me that wants to delete everything and be much more private, and just keep my special moments personal and to myself . . . anyways, I am totally rambling here. But I really want to put some thought into what I’d like to achieve in 2018 :) because as you know I am a type-A personality and can’t do it if I don’t have a list! Anyways, what was the purpose of this post? Ohh yes, Rome! Rome was one of the few major cities in Europe I hadn’t managed to visit after almost eight years of living in The Netherlands. From Holland, it’s inexpensive and easy to hop on a plane and explore elsewhere in Europe, even if it’s just for the weekend. And while there are some major European cities I’ve been to numerous times, I’ve never managed to catch a weekend in Rome. Above and below is a snapshot of our first glimpse of St. Peter’s Basilica, which was beautiful, but so overcrowded with tourists paying homage to one of the most sacred places in Christendom. 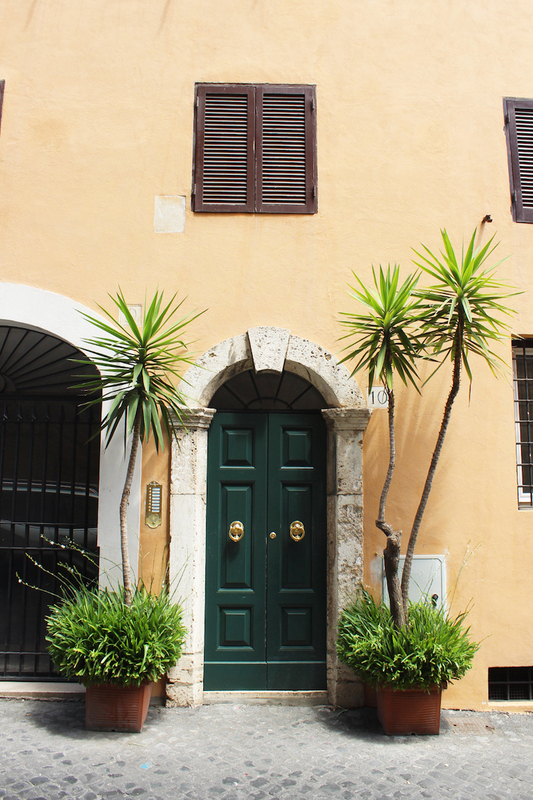 I preferred roaming the streets aimlessly – the weather in Rome was perfect (actually a bit TOO hot in the coming days) with vibrant green leaves on the trees, spattering fountains, cobblestone streets, and soft pastel architecture. This is the Castel Sant’Angelo, which was originally built to serve as a mausoleum for the Roman Emperor Hadrian and his family. 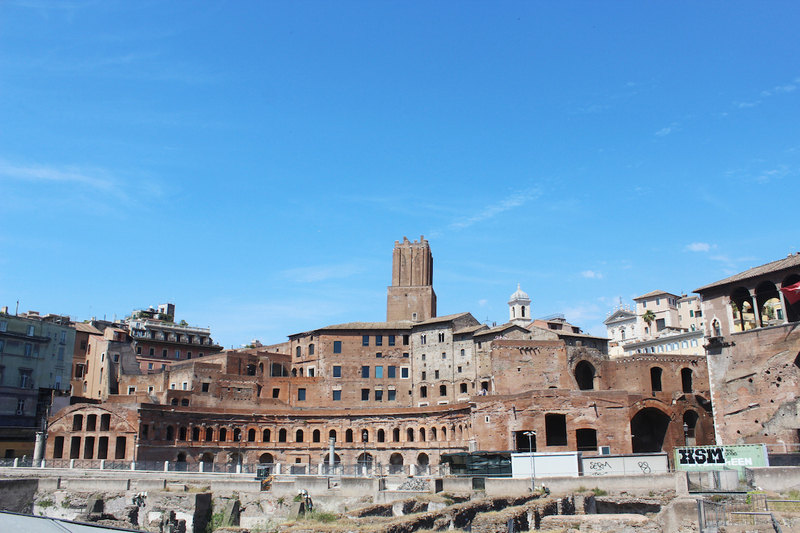 In its heyday, the castle was the tallest structure in Rome. Throughout time, the use of the castle has changed, later used as a Catholic fortress, and most recently, a museum. 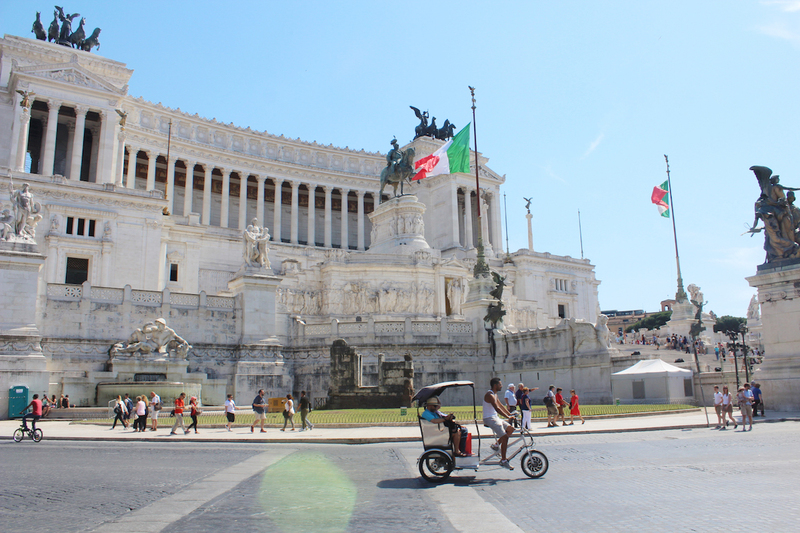 We then walked by the Altare della Patria (I had not idea what it was called at the time!) 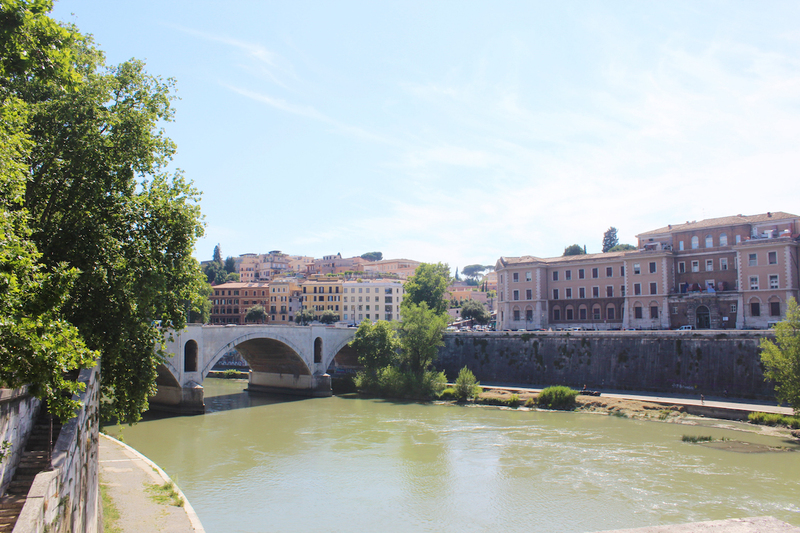 and Rome won a special place in my heart. One of the reasons I love Amsterdam so much is that you can simply walk around and really take in the essence of the city. A nighttime stroll along the canals to admire the twinkling architecture is one of the most romantic Dutch activities. While Rome is much bigger than Amsterdam, the city has an essence that can be easily admired by foot – some of the city’s sites are akin to an open air museum, with art and history seemingly staring at you lovingly on every corner. The Roman Forum solidified this thought, with beautiful, ancient crumbling buildings scattered everywhere, dating back to ancient Roman times. 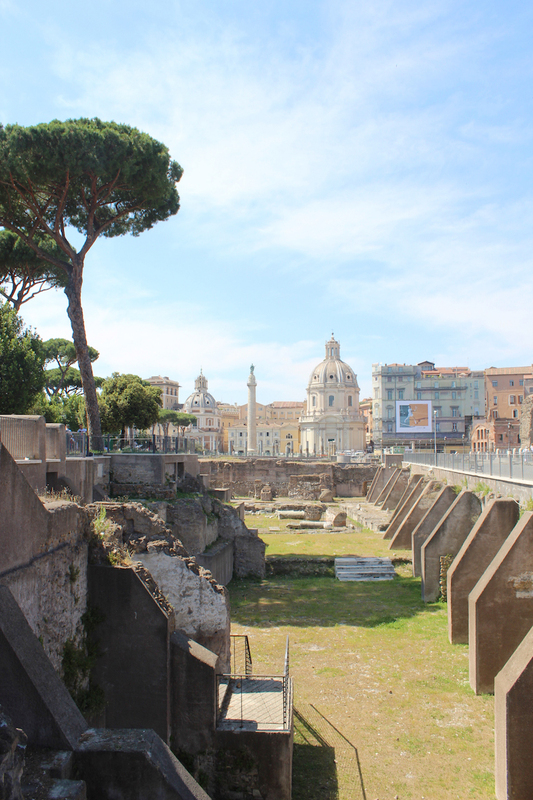 After we wandered around the Forum, we approached the Colosseum, which is surely one of Rome’s most notable landmarks. We debated paying to go inside, but after an extensive day of walking around and admiring the architecture, we opted to sit on a terrace accross from the Colosseum and get a drink. Besides, I think the most magnificent part of the Colosseum is the view from the outside ;) After our drink by the Colosseum, we wandered through back streets on our way to Trevi Fountain. With a quick pit stop in the most colorful pasta shop I’ve ever seen. The Trevi Fountain is probably the most famous fountain in the world, and in my opinion, it’s also one of the most beautiful. It’s the biggest Baroque fountain in Rome, a title it has held since its completion in 1762. Although not too noticeable in these photos, hundreds of people flocked around the fountain, flicking in coins, dipping fingers in the cool water, and posing for photos. I too chucked a coin in for good luck, and posed for the quintessential Trevi Fountain photo. I have to say, I am pretty self conscious of this next photo because I think I had gained about 10lbs at this point due to so much pizza and pasta (hellllo hips and boobies!) but hey, it’s about tbe amazing memories and not how I look! We popped into a few other shops around the fountain, buying some cool souvenirs (hello cute new leather purse!) before heading back to our apartment to freshen up for dinner. I feel a little bad about this next stop, as I accidentally stole it from Kai. Before my family left for Italy, Kai shared his Rome bucket list with me. He’d been collecting recommendations from his Italian friends, with the intention of spending a few days in Rome with me after my family left (more to come on this!) So on our first family-night in Rome, we chose one of the spots from Kai’s list, but it turns out it was the spot he had wanted to visit the most! So we ate at Velavevodetto to Quiriti, unknowing that we were stealing the spot Kai was most excited about. 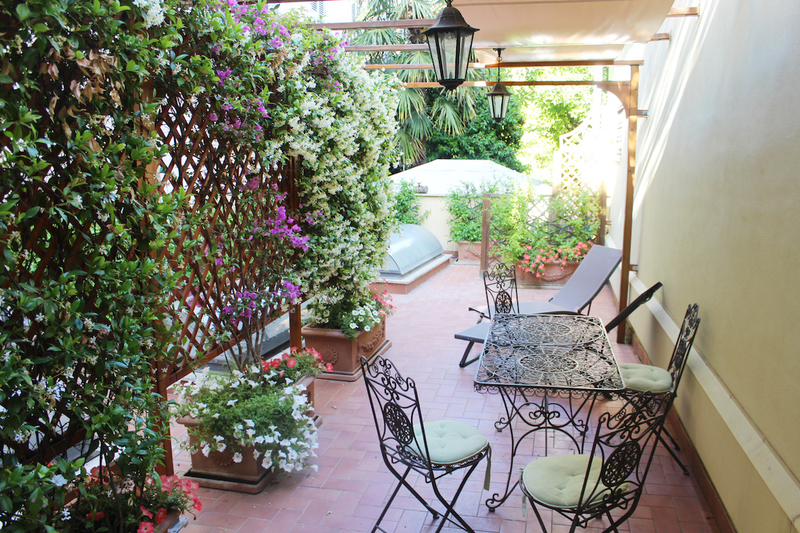 The weather in Italy could not have been more beautiful, and so we ate outside every night. Our evening at Velavevodetto to Quiriti was no exception, and with ample outdoor seating we were able to snag a table without a reservation. The pasta was to die for, the company was excellent, and the wine was spectacular. I could eat creamy pasta with fresh tomato sauce and parmesan cheese every night and have the happiest belly! We spent our second day in Rome at the Vatican. My aunt really wanted to see the Sistine Chapel, which can only be accessed with a ticket to the Vatican Museum and a lot of patience, as there are tens of thousands of people swarming the tiny country, and as you might expect, very long lines to get into the chapel. My aunt very kindly offered to pay for a guided tour for us all, so while we did have to roam through the hallways of the Vatican Museum with everyone else, we did get to enter the museum through the tour only door which had a much shorter line to get into the building. 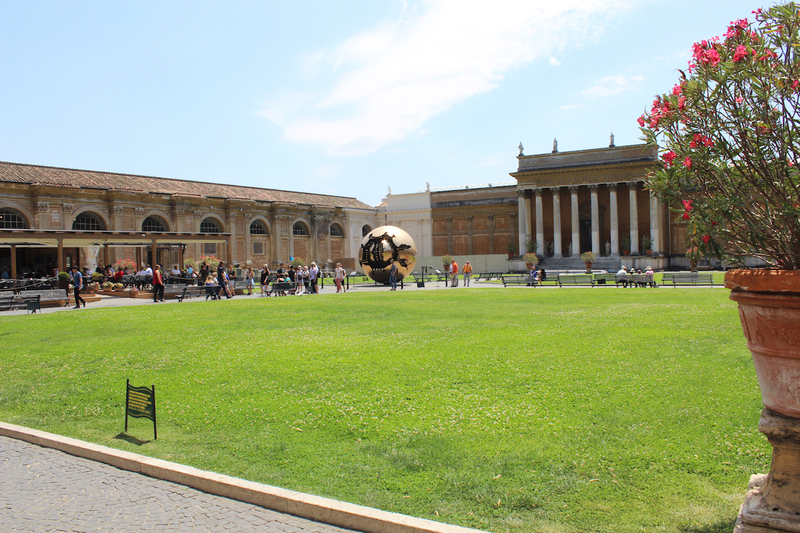 Inside the Vatican Museum, there are hoards of people everywhere. To get to the chapel, you are slowly herded through the halls of the museum like a live piece of beef, before finally being granted entrance to the chapel. To be fair, there are breathtaking sculptures, mosaics, paintings, and tapestries in the museum along the way, but I found it hard to take everything in with the high volume of people. This photo below should give you a good idea – instead of casually strolling through the museum, you are pushed along in a stream of slow moving bodies from room to room. But again, the work exhibited in the museum was timeless and captivating. Even the floors were stunning and I couldn’t help but snap photos of my feet in almost every room! After about two hours of walking, we finally made our way into the Sistine Chapel. 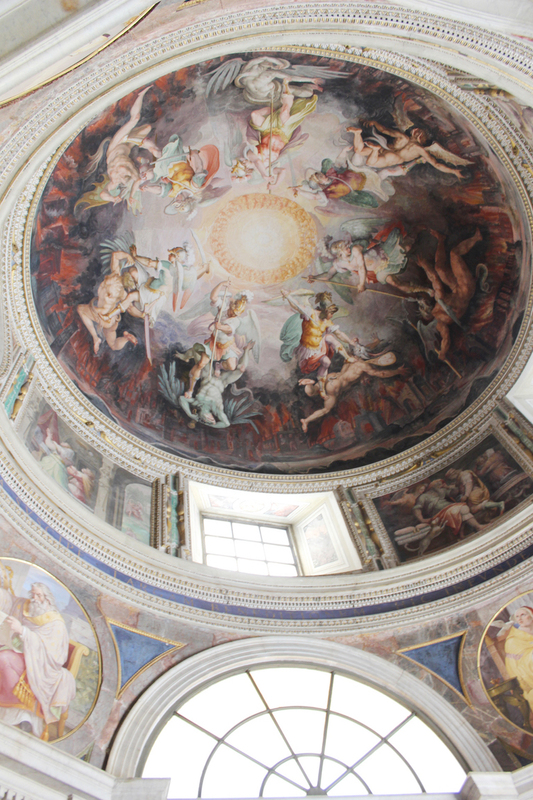 There are no photos permitted inside the chapel, but I did take a million and one photos of the beautiful Dome Cupola of Angels Fighting Demons inside the Vatican Museum, which in my opinion match the beauty of Michelangelo’s work in the Sistine Chapel. The colors and the natural light here played so magically well together! So to sum it up, while I prefer off-the-beaten-path attractions (I wrote a whole book on off the beaten path attractions in Amsterdam!) 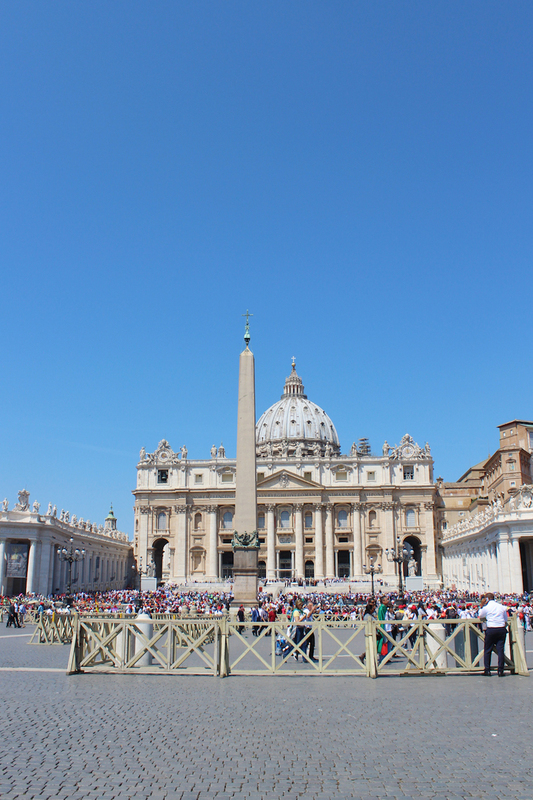 I felt the same tug as my aunt and mom – you can’t go to Italy and miss out on seeing the Sistine Chapel :) To finish off our visit to Vatican City, below are a few photos from St. Peter’s Basilica, another architectural marvel, which we visited following our tour of the museum. On our final family night together in Rome, we went to a restaurant that my cousin’s friend had recommended. We weren’t quite sure what to expect, but had been told the place was GOOD. And so we arrived at Osteria de Memmo I Santori, ready for our last meal together. At this spot, I’d absolutely heed a recommendation. The space was packed, but thankfully we’d called up earlier and were led to a small table for four in the back. 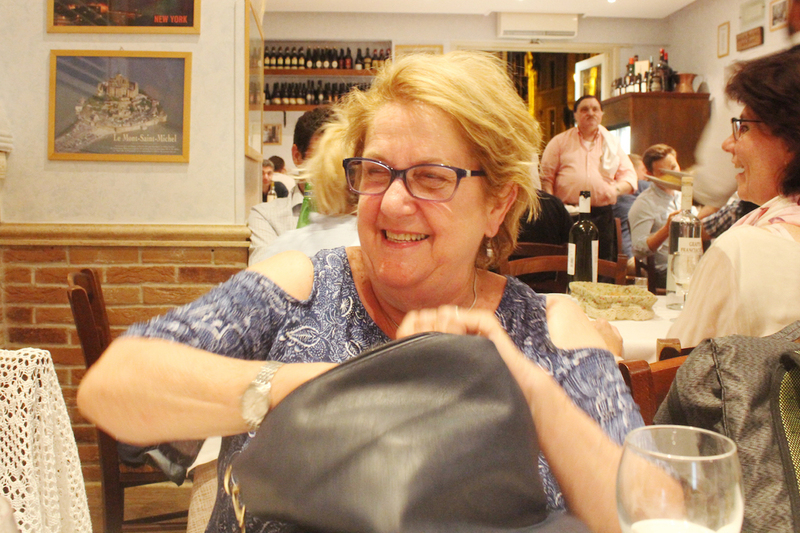 What followed was by far my favorite meal in Italy – the waiter who came to our table took our drink orders and then asked if we wanted to start with the antipasti. We weren’t quite sure what to expect, but in the spirit of our last night in Italy, we said sure! What followed was dish after dish of the most authentic and fresh Italian food. First, melon arrived. Followed by fresh prosciutto, followed by bowls of creamy mozzarella balls, and a wide assortment of grilled vegetables. We were astonished at the amount of food, and how amazing it all looked. Just when we thought it would be impossible to squeeze another plate on the table, the waiter started stacking dishes, bringing a total of around 15 bowls to our table to feast on. 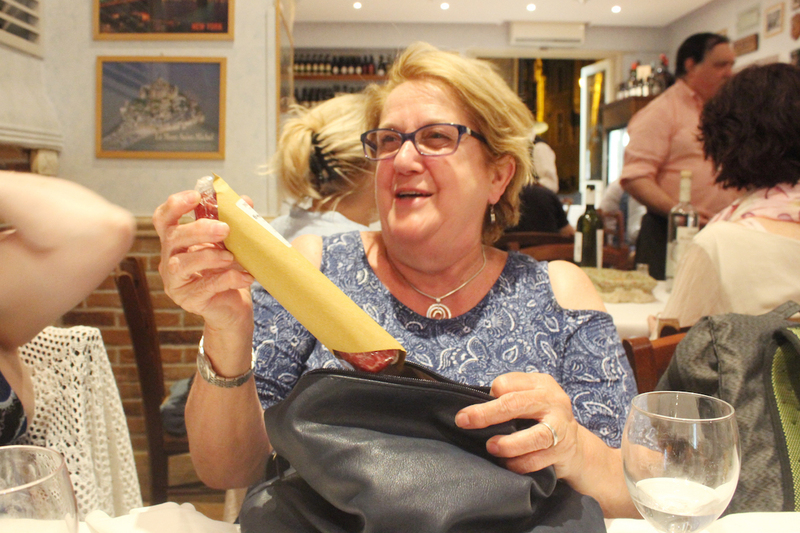 It was THE BEST meal I’d had in Italy, and I would heed anyone reading this and planning a trip to Rome to put Osteria de Memmo I Santori at the top of the must-list! Following the antipasti, which very easily could have been the whole meal, we shared some calamari, which was also crispy and fresh. There was also a lot of wine involved, as well as some vodka poured over lemon sorbet, which my cousin Julie declared genius.